Long Beach, CA, May 1st 2010 - Reigning LA Calendar Bike Building Champions, AFT Customs of Martel, CA, with owner designer Jim Guiffra and his AFT Motorsports Model Agency spokesmodels (AFTcustoms.com), will again use this year's 2010 LA Calendar Motorcycle Show on Sunday July 18th at the Queen Mary Event Park, Long Beach, CA to premier their latest custom built and potential Show winner "Kimosabe". Then after the Calendar Show the AFT crew and the bike will head to the legendary Bonneville Salt Flats in Utah to participate in the BUB Speed Trials where two of the girl builders, Sukhee and Shelby, will pilot the bike on speed record attempts. Also helping with the bike build and attending the events are models Cyndi, Sara, Malanie and Katy. Jim and his AFT Models will be holding one of three Calendar Bike Building Seminars at the Show, to detail to fans how they designed and built "Kimosabe" with the help of their sponsors including Miller Electric, JE Pistons and Avon Tires who will be there with them. 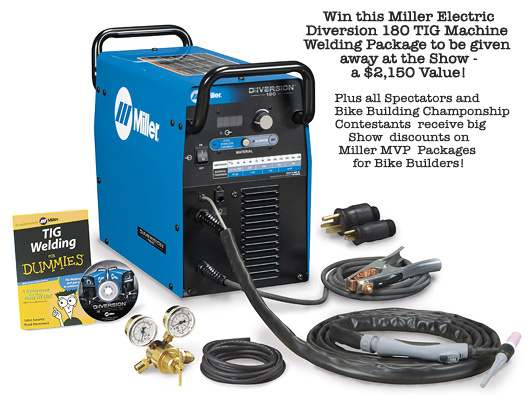 Miller will be giving away at the Show their professional caliber "Diversion 180 TIG Machine Welding Package" valued at $2,150 to one lucky spectator, along with Miller Calendar Show Discount Coupons to every Show visitor valued up to $150 cash back on Miller Equipment purchases. If you are a Pro or Hobbyist builder in need of any welding gear, your Calendar Show admission will be returned many times over with these exclusive discounts from Miller. Stop by the AFT Miller Electric display any time during the day to sign up for the TIG Welding Package Giveaway, and to pick up a Miller Calendar Show Discount Coupon towards a future purchase. Miller Technicians and the AFT Models will be there with a product display and demonstration to help with any welding questions. The winner of the TIG Welding Package Giveaway drawing must be present during the Awards Ceremonies which start at 5pm. New Kimosabe Build Preview Video for your News Media website!